Grupo Danson was founded in Copenhagen, Denmark in 2001 by Cuban trombonist Carlos Pérez (ex-member of Paulo F.G. y Su Élite), Danish trombonist Mia Engsager and Cuban bassist Yasser Morejón (ex-member of Rojitas y su Grupo). The name doesn't refer to danzón music but rather the fusion of Danish and Cuban, i.e. Dan + Son. 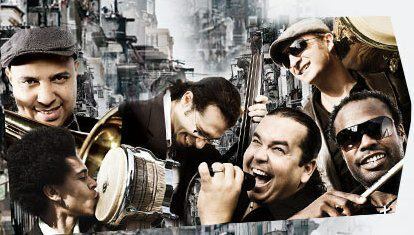 As the name suggests, the band was originally inspired to perform traditional Cuban dance music, such as son, which was experiencing a huge resurgence in international popularity due to the success of the Buena Vista Social Club movie and albums. In 2005 Grupo Danson began a fruitful collaboration with renowned Cuban trumpeter Alexander Abreu. Alexander had been writing his own lyrics, and working with Danson provided him the chance to set aside his trumpet and sing lead. In turn, Alexander's music inspired Carlos and Mia to begin composing original songs. In 2005 Danson released their debut album, which won the Djembe Award for “Best World Track of 2005” for “Mi Música”, the title track and one of Alexander's songs. There is no doubt that the overwhelming success of the songs that Alexander wrote and performed with Grupo Danson led to his returning to Cuba to form Havana D'Primera. Grupo Danson has continued their collaboration with other Cuban artists. In 2009 they performed together with Mayito Rivera doing a mix of his own repertoire and Danson's hits. On their second CD, "Mezclando Culturas" released in the fall of 2014, bassist and composer Alaín Pérez co-produced the CD with Carlos and sings lead and plays bass on a new arrangement of his song "Sabor de Mi Rumba". Danson also recorded a number with Mandy Cantero (Los Van Van) for the album, "Va y ven de hamaca". Grupo Danson exploded on the timba scene with their debut album "Mi Música" and is one of Northern Europe's leading timba bands with a roster of excellent musicians, and an exciting live show geared towards dancers. We are looking forward to more award-winning timba when "Mezclando Culturas" hits the streets!